Republicans, struggling with the mounting crisis created by the Trump administration's new family separation policy, are planning to vote this week on two competing immigration bills. On Tuesday, President Donald Trump went to Capitol Hill to sort out this mess and lead his party to a solution on an issue that has divided the country for years. Or maybe not. 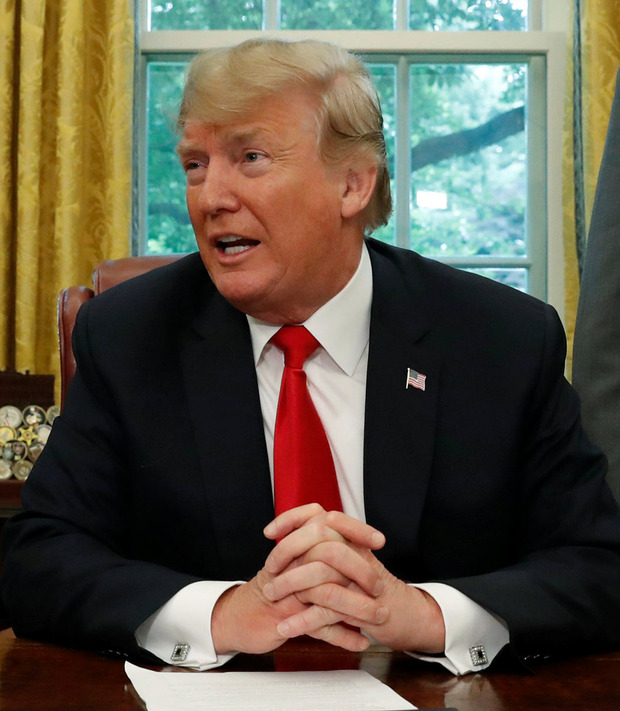 The 'Washington Post' reported: "President Trump implored anxious House Republicans to fix the nation's immigration system but did not offer a clear path forward amid the uproar over his administration's decision to separate migrant families at the border. "Huddling with the GOP at the Capitol on Tuesday evening, Trump stopped short of giving a full-throated endorsement to immigration legislation meant to unite the moderate and conservative wings of the House Republican conference. "'He didn't really tell us what bill to vote for,' said Republican Markwayne Mullin of Oklahoma, saying Trump laid out his principles on immigration and told Republicans he 'wanted to take care of the kids' - a reference to the unfolding family separation crisis." According to multiple reports, Trump also rambled on about his poll numbers, North Korea and the tax cut, and took time to insult Republican Mark Sanford, who recently lost a primary to a more Trumpian opponent. The master negotiator strikes again. What's happening right now is that the horrifying images of children being torn from their parents' arms have spurred House Republicans to take one more shot at broad immigration reform. But they're going to fail, just as they have so many times before. Republicans are supposed to vote today on two competing bills. One, a hard-line measure sponsored by Congressman Bob Goodlatte, would significantly reduce legal immigration, beef up border security, require employers to use the E-Verify system to verify the citizenship of employees (it's currently voluntary) and give the "dreamers" a temporary legal status but not citizenship. The other, a slightly less severe measure supported by the House leadership, would also restrict legal immigration, but wouldn't require E-Verify and provides a path to citizenship for dreamers. So why do I say this is going to fail? They can't agree among themselves. Since Democrats aren't going to support either bill, Republicans have a small margin for error, and they're confronting a problem they've always had: Their few remaining moderates are skittish about the harsher approach, while their conservatives don't want anything they think is "amnesty" for anyone, including dreamers. Everyone acknowledges the Goodlatte bill doesn't have the votes to pass, and it looks as though the compromise bill - which, we should note, is still very harsh - will also lose enough hard-liners to fall short. As far as they're concerned, doing nothing is a viable option. As much as Republicans say they hate the current immigration system, they've shown time and again they're perfectly happy to shake their fists at it but leave it in place. If the alternative is voting for a bill a far-right primary challenger will say is amnesty, many of them would rather do nothing. They've seen how people such as Senator Marco Rubio got punished for trying to achieve comprehensive immigration reform that included a path to citizenship for undocumented immigrants and they don't want to put themselves at risk. The president won't help them. Just in the past week, Trump has gone from saying he won't support the compromise bill to saying he supports both bills; as one Republican said after yesterday's meeting: "He made comments like 'I'm behind it 1,000pc,' but what is 'it'?" Members of Congress have learned Trump simply can't be trusted to keep to a single position from one day to the next. If you were one of them, would you stick your neck out on the theory the president had your back? The Senate won't pass either of these bills anyway. Majority leader Mitch McConnell has said he doesn't have any intention of bringing up a comprehensive immigration reform bill this year, and it's almost impossible to see how even the compromise - which, to repeat, is still extremely harsh - could get the votes of nine Democrats, which is what it would need to reach 60 votes and overcome a filibuster. The only incentive is to deal with the family separation crisis and leave it at that. Every day brings more horrifying stories and images of the children who are being separated from their families at the border as a result of the administration's "zero tolerance" policy. Trump claims he hates doing it (which no one believes) and it's the fault of imaginary laws passed by Democrats (which is just false). So there's a solution: pass a narrow bill dealing just with this issue. There are bills circulating from Democrats and Republicans to do just that. Passing one of them could handle the Republicans' immediate political problem without creating others for them with their own base, so that's the path they're most likely to choose. Then they'll go home and tell their constituents the immigration system is a mess and we absolutely have to do something about it. One of these days.